You are viewing Kleur/Colour which is posted in the product category. I'm sorry to be so Dutch-centric, but some amazing things are coming from the Netherlands these days. 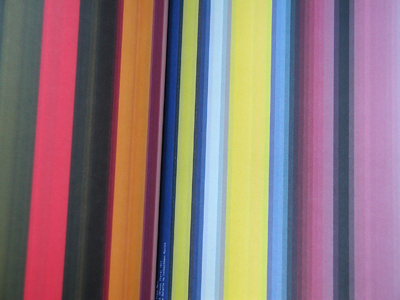 "Grafisch Nederland 2005 - Kleur/Colour," designed by Irma Boom, is a monumental achievement in the art of bookmaking. It's probably one of the most remarkable pieces of printed matter I've seen. 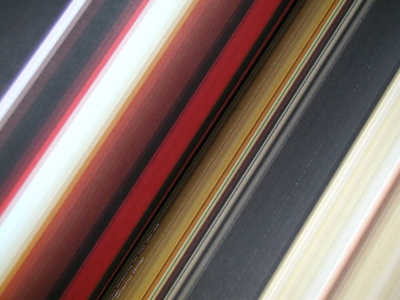 Grafisch Nederland is an annual yearbook published by the Dutch Association of the Graphic Industry. Each year, a team (designers, printers, binders, etc.) is created to produce a book based on a given theme. The stars were definitely aligned for 2005. 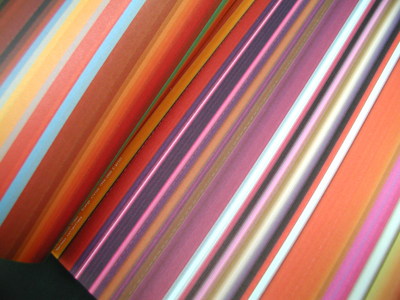 Most of this publication's allure can be attributed to its color. A majority of other printed pieces (i.e. 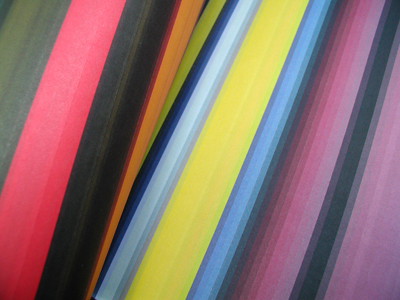 posters, magazines) have colors derived from a combination of four inks: cyan, magenta, yellow, and black (CMYK). 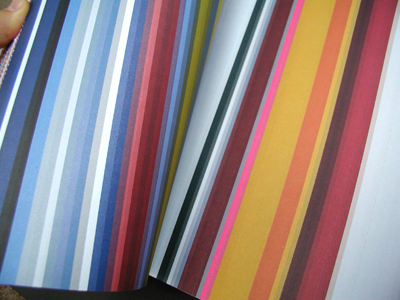 This book contains over 80 Pantone (premixed) inks with hues and shades that are impossible to achieve through CMYK. Point is: the colors are vivid, lush, occasionally surprising and always stunning. The contents of the book consist of abstract line diagrams based on the palettes of famous contemporary and classic paintings (I was only able to guess three!). 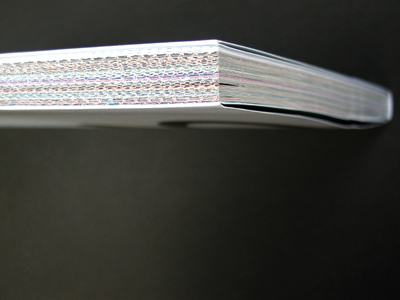 The pages are uncut and perforated, therefore the reader must cut open every other page to reveal the spread. 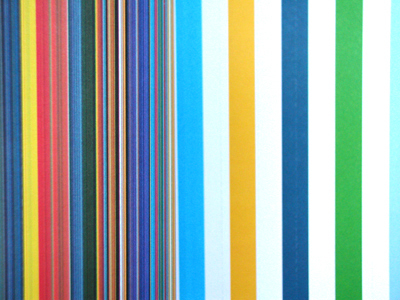 "Colour is one of the most frequently discussed subjects in art, sciences and everyday life. Thousands of books have been written about it. There are even whole libraries—the Faber Birren collection (Yale University, USA), for example—that are devoted entirely to colour. Colour is a phenomenon that is almost impossible to grasp, and yet everyone has something to say about it. 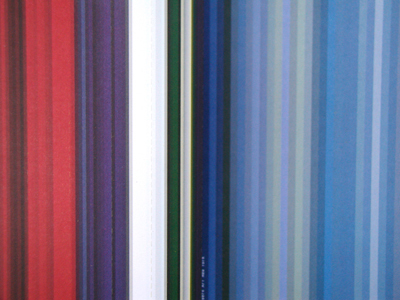 ...For psychologists and philosophers, artists, physicists and chemists, colour is a subject of study. 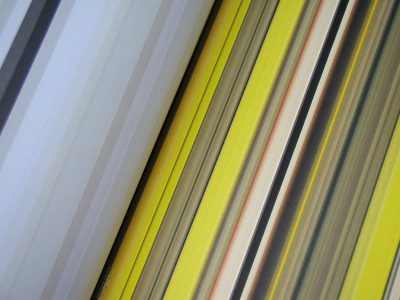 For the designer, architect and painter, and for the printer too, it is a tool." just as they have done with this book, i am always amazed how dutch designers pick intimate ideas and realize them with such richness. in my own work i am always telling myself to aim smaller. it's one of the hardest things to teach young design students. thanks for showing off the book. the photos reminded me of the colors in this photoset, which you might like. Nice! Simple is always better. beautiful! wow. i don't think i could easily choose 80 pantone color and make them work together. this must have taken forever to print. i'm curious... how is the content/information of the book presented so that it doesn't compete with the color concept? Sandie: The diagram information runs vertically in the gutter. You can see traces of the white text in some of the detail photographs. Unobtrusive and subtle. The last few pages and the inner jacket have body copy printed in rich black on white. 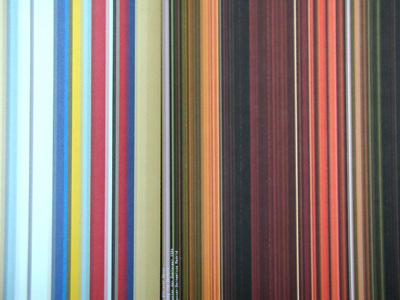 The strangest detail about the book is that the outer cover consists of overprinted CMYK solids! kfan: Thanks for the link! My favorite is "red wine," of course. this may not be as visually engaging, but i like complex visualizations of absurd proportions like Color Code. it is a color representation of 33,000 nouns grouped by meaning. be advised this only seems to work in internet explorer on the mac. not sure which browser for pc.